Bulgaria could immediately host the Winter Olympics, ski legend Alberto Tomba stated at the opening of the ski season in Bansko. "Once Sochi can organize such an event, Bulgaria should also cope'' said the l legend, nicknamed La Bomba. According to him it is completely realistic for Bulgaria to get the rights to organize the major event in 2022 or 2026 by latest. "I admire how quickly you develop your resorts. 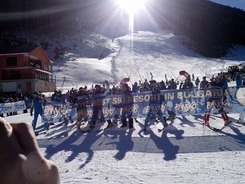 Alpine ski could be held in Bansko, jumping in Vitosha, biatlon in Borovets and ski running in Pamporovo, Tomba noted. Tomba opened the ski season in Bansko with other legends Marc Ghirardelli, Luc Alphand, Jure Kosir and Peter Popangelov and another 14,000 skiers.